Who is not familiar with Komodo Island? Most of Indonesian people already know about the island that has rare animals are believed to be the species of the last dinosaurs on earth. Is an island located in the Nusa Tenggara Islands East bordering with the province of West Nusa Tenggara. This Place is entrance to the Komodo National Park along with the other large island in the Nusa Tenggara islands such as Rinca Island, Padar Island, the Island of Motang and many other small islands. 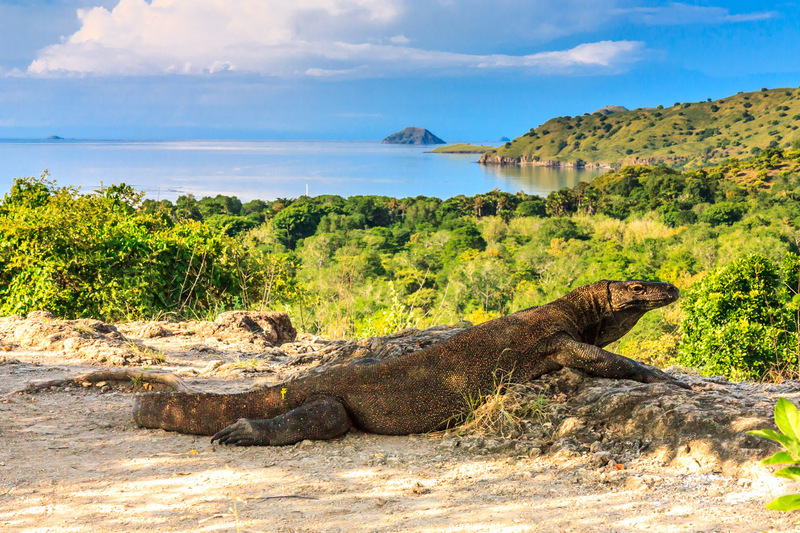 The island that the original habitat of this rare animal has approximately 2,000 Komodo dragons living in the wild. When you visit this island, you will be presented with a unique experience because you can observe the behavior of the predator beast when hunting prey or fighting each other. In 1986 the island was designated as a world heritage by UNESCO and nominated to be a place seven wonders of the world. Komodo or commonly called by local residents as the Ora’s have the average body length reaches 2-3 meters and weigh up to 170 Kg. rare animal and this beast belongs to the reptile type of giant lizard a meat eater. This animal has long nails and the skin thick scaly and forked tongue that is always sticking out. The saliva of this rare animal have a poison that is very deadly, it became one of the deadliest weapons used when hunting prey. This Place not only presents a current view of the see how endangered animals live and breed in the wild but the island also has other attractions which will certainly be an attraction and a unique experience of its own when you visit the island of Komodo. In addition to the place, is also the habitat for other animals such as horses, deer, snakes, various bird species and other. One of the things that you can do when visiting the Komodo Island is trekking. you can do trekking to climb mount Ara which has a height of approximately 320 meters above sea level. Along the way you will be in overlooking the exotic nature and diverse types of plants and also animals. If you choose trekking in this island you will be able to have 4 lines trekking with the length of the route 1 – 8 Km. trekking in this region you will be guided by a tour guide rangers so you don’t need to be afraid of getting lost or fear of being attacked by a giant lizard. so you will always be safe when travelling on this island. Another thing you can do when visiting the Komodo island is diving and snorkeling. Komodo Island is also known with the beautiful underwater scenery. So suitable for you who have a hobby of diving while enjoying the beauty of marine life there. From the data, the nature of the sea on the island of has more than 300 types of coral and 70 kinds of corals, which is certainly very beautiful. Travel under the sea in the area of the paradise is have a spot spot or the point of a good dive for divers, among others, stone Samsia where you can walk down the drains and can interact with turtles or other small fish. a submarine next namely stores that are at a depth of 7 m and has diverse coral reefs. And the last is the crystal Rock, a submarine is at a depth of 5 m. here you will find a wide variety of sea fish.